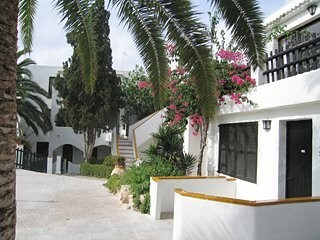 This apartment complex features a convenient location on the outskirts of Cala d'Or, just 250 metres from a sandy beach. Golf lovers staying at this property may have the chance to practice their swing in the nearest golf course, situated just 10 kilometres away. The resort centre with its countless shopping and entertainment venues is a short driving distance from this aparthotel and there is a stop for the public transport just a few steps away. Spread over 3 floors, this establishment offers a choice of fully-equipped apartments and studios ideal for those travellers wishing to enjoy the freedom of a self-catering accommodation. The onsite facilities include garage facilities as well as lounge room and a children's playground, perfect for the younger guests. A swimming pool and sun terrace are also available in this 5,000m2 garden complex.